Is Congress running out of steam in Assam? Rahul Gandhi: The 'official liquidator' of the Congress party? 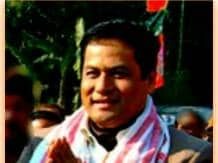 Sarbananda Sonowal, president of the Bharatiya Janata Party (BJP) in Assam and Union sports minister, tells Bivekananda Biswas he is determined to expose the Congress' record of misgovernance in the state. Assam is set for Assembly elections early next year. Any lessons from the BJP's debacle in the Bihar polls? Assam has problems of a different kind (from those of Bihar). The Congress has been in power for the past 15 years. Manmohan Singh has been a representative from the state in the Upper House for the past 23 years; for 10 of those years he was prime minister. That means both (Assam Chief Minister) Tarun Gogoi and Singh represented the state. I think that 10 years was enough for them to devote themselves to the development of the state. They could have taken a lot of initiative to find solutions to persisting problems. But they have done nothing. What people have seen is a government of non-performance. Instead of giving the people of Assam good governance, they have resorted to corruption and malpractice. As a result, more than 30 million people in the state have had to suffer and live in insecurity, both economically and in terms of protection of their property and lives. Because of the misrule of the Congress and also its association with illegal migrants, local people have suffered from an identity crisis. Gogoi once said, "Who is Badruddin Ajmal?" He is the representative of illegal migrants. The All India United Democratic Front (AIUDF) came into being in 2005 after the IMDT [Illegal Migrants (Determination by Tribunal)] Act was repealed in 2005 by a Supreme Court order. The group is an assembly of 14 Muslim fundamentalist groups. Their intent was to protect the interests of the illegal migrants. When Gogoi challenged Ajmal, people of Assam trusted him, thinking he would work for their interests and protect their identity. But that did not happen. Now the two groups have joined hands. This has led Assamese society to believe that the Congress is not interested in protecting their identity. That is one reason the Congress is losing its foothold in Assam. The greater Assamese society comprises Assamese, Bengalis, Marwaris, Sikhs, Assamese Muslims, Punjabis, Buddhists, Christians, Hindus, Jains etc. What is the BJP's development agenda on Assam? People have realised that under Gogoi's leadership development is not possible. That is why the BJP's vote share increased from a mere 14 per cent (in the 2009 parliamentary polls) to 39 per cent in the 2014 Lok Sabha elections. We were number one in 69 Assembly constituencies out of a total of 126 in the state. People have reposed faith and trust in the BJP and it is working for the development of the greater Assamese society. For the first time in the 68 years of India's Independence, Prime Minister Narendra Modi has directed the Council of Ministers to visit north-eastern states every fortnight: not only to focus on issues but also to ensure growth was happening in the region. The Centre has taken several measures for the development of Assam. Recently, Union Road Transport and Highways Minister Nitin Ghatkari promised an investment of Rs 1 lakh crore for building roads in the next five years in the state. Railway Minister Suresh Prabhu has announced Rs 28 crore for the development of railway networks in the state. Several central departments have announced policies for the north-eastern region. Being the largest state in the region, Assam will be the biggest beneficiary of these schemes. Illegal migrants are largely Bengali-speaking Muslims. Do the Congress and the AIUDF represent them? How important will this issue be in the Assembly election? It is a very important issue. The growth of illegal migrants is alarming; the solution to this issue will determine the fate of the people of Assam. This is the last battle for the Assamese people to protect their identity. Are you alarmed that 34 per cent of the state's population is illegal migrants, according to the Census? Yes, it is an alarming trend. It is destroying the demographic structure of the state. Because of the unusual growth of illegal migrants, local people have been pushed to becoming a minority. There was rampant influx of illegal migrants in the past. The BJP's objective is to protect the greater Assamese society. Within a year after the BJP came to power (at the Centre), it sealed the entire Indo-Bangladesh border and deployed modern devices to check illegal migrants from crossing into Assam. The Congress promised in 1985 in the Assam Accord that it would take all possible steps to prevent illegal migration. It did nothing. But we have started implementing what we promised. During the land-swap agreement with Bangladesh, illegal migration was the main issue. Due to the porous border, immigrants used to cross over. Now the Centre has taken strict measures to prevent them. Will the Centre not release funds till the Assam government submits the fund utilisation report? This is the nature of the Centre-state relationship. If you don't release a report, how will people know where the money has been spent? If the government does not provide accounts for a particular scheme, people will never know how much has been spent. This charge has not been made by me or a person on the street but by the Comptroller and Auditor General of India. But the Congress demand is that the BJP release a white paper on funds provided to the state in the last 18 months. Gogoi accused you of not putting pressure on the Centre to release funds for development schemes. No, I have demanded that all the records of the past 14 years be submitted. They have not done that yet. Are you going to forge an alliance with parties like the Asom Gana Parishad (AGP) and the Bodoland People's Front (BPF)? We have started a dialogue with all regional parties, whether it is the Bodos or the Kacharis or any other political parties representing the Bengalis, Jains, Marwaris, Christians and Sikhs. All sections of society -tribals, non-tribals - and all regional parties are welcome to join our fold for the betterment of society. Any progress with the AGP and the BPF? Has there been any progress on granting Scheduled Tribe (ST) status to six communities? The government of India is actively considering this issue without affecting the interests of the tribals (who have been granted ST status). The BJP has never been against the Muslims. We have accepted all Muslims who came to Assam before March 25, 1971. We not only support but also strive for the uplift of these people. We have accepted them as Assamese. The party will protect the dignity and faith of Indian Muslims. There will not be any discrimination against them. We are against illegal migrants. That pertains to modalities. We are working on it. To grant ST status to these communities, we have to bring in changes to the modalities. As of today, the Constitutional framework is not adequate to accommodate them. It will take time because for that, we have to bring in changes to the Constitution. The Congress has always spread misinformation. This is not a new issue. This has been an issue for several decades. The BJP has done its homework and we have consulted with all departments of the government of India on the matter. It is the BJP which has started working on the issue seriously; the Congress only made promises.